Ah! The wonders of my filing cabinets. Having moved rooms at work a number of times, thrusting stuff quickly into folders, and into boxes when I retired, I shouldn’t be surprised if nowadays ‘lost’ research turns up in the most unlikely places. I’ve just found a report from another excellent research assistant, Margaret Burgmann which I’d like to share with you. I was preparing the first volume of Barefoot & Pregnant? at the time and was looking at reasons for the brevity of the Earl Grey scheme. I wanted to test the claim it had become increasingly difficult to find suitable employers for the orphans. In the words of Melbourne officials, “…the orphans by each succeeding ship have been disposed of to parties of a lower rank, and less desirable class than those preceding”. Or as Archdeacon McEncroe put it, “…the cause of dissatisfaction was with some vulgar masters who had got up it the world. Those who had got money by the gold discovery are the most overbearing towards their servants”. Margaret used W & F Ford, Sydney Directory, Sydney, 1851, Francis Low, The City of Sydney Directory, 1844-5, Sydney, 1844 and his Directory for the City and District of Sydney, 1847, as well as Sands and Kenny, Commercial and General Sydney Directory for 1858-59, (first year of publication). With some qualifications, her conclusion was that yes indeed, 84% of the 1848 applicants were from the upper middle class. In 1851 only 52% of them were. Margaret reminded me that “applicants in 1851 were harder to identify. 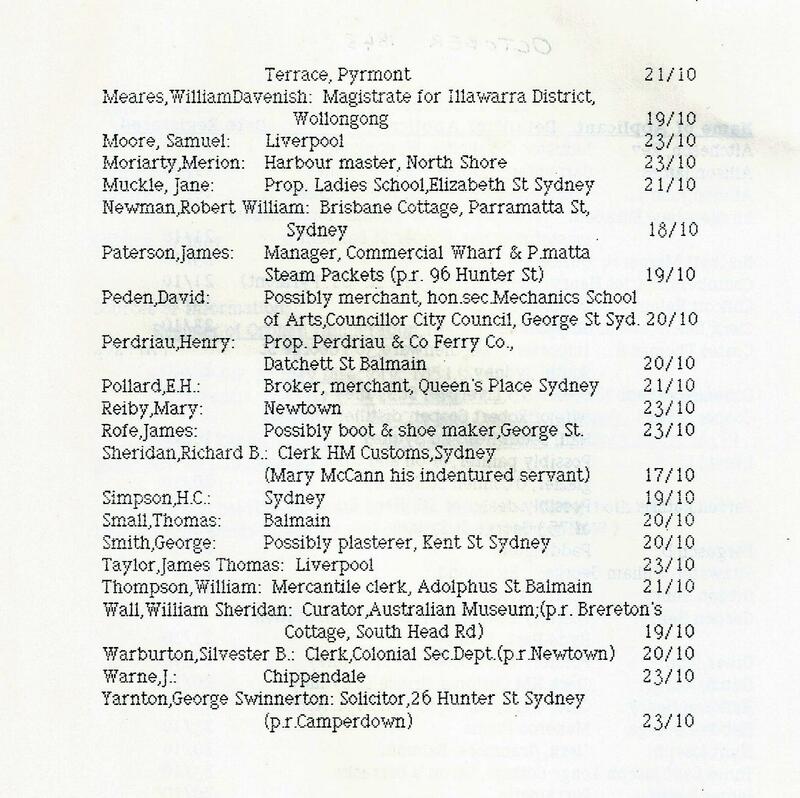 There were many more applicants from outside Sydney. 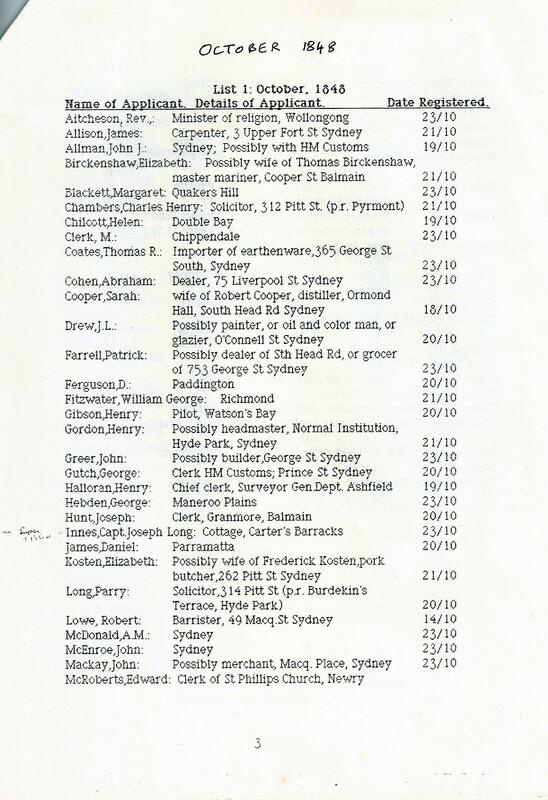 Further, the directories concentrated on white-collar and well-off blue-collar members of Sydney society. Only occasionally was an entry classified as ‘gentleman'”. I hope this will encourage people to find out more about the masters and mistresses of their own particular orphan servant(s). What directories and other sources could we use? 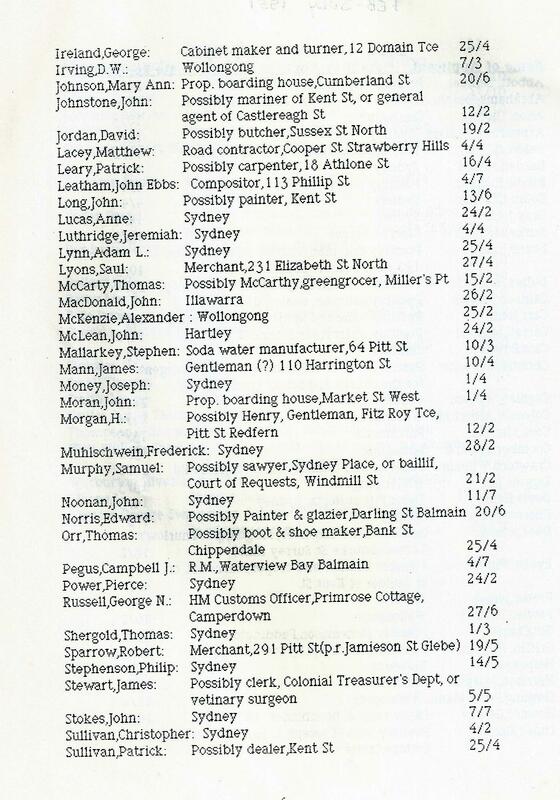 This entry was tagged Registers of Applications for orphans, Sydney Directories. Bookmark the permalink. I enjoy your posts but my main problem is that I can never find my Irish Orphan on your database. She is in your book, “Barefoot and Pregnant” although she wasn’t! And the ship she arrived upon – The Pemberton – is listed but not her name – Margaret Galvin. She is also not on the Memorial in Sydney. She is part of the memorial in Victoria, I feel a little incensed that it appears the the Sydney/Melbourne rival is well and truly alive. You may like to look again. Margaret was first employed by Mrs Reid, draper, Collins St at the rate of 10 pounds per annum, for three months. I’m sure people have answered your query about names on the monument in Sydney before. Here’s the link to Margaret. I’m not sure what you are after. A Kate Kennedy per Pemberton was employed by Mrs Greaves of Portland at the rate of 8 pounds per annum. Vic records include ‘disposal lists’ of the orphans i.e who first employed them. I’m not sure records of those who applied for orphan domestics exist separately from that. Elizabeth McKay (aged 19, arrived John Knox 1852 with her sister Sarah), though I know her as Elizabeth Mackey/Mackay. I have no information on Edward Coomber other than his suspected birth c1820 in Spitalfields. 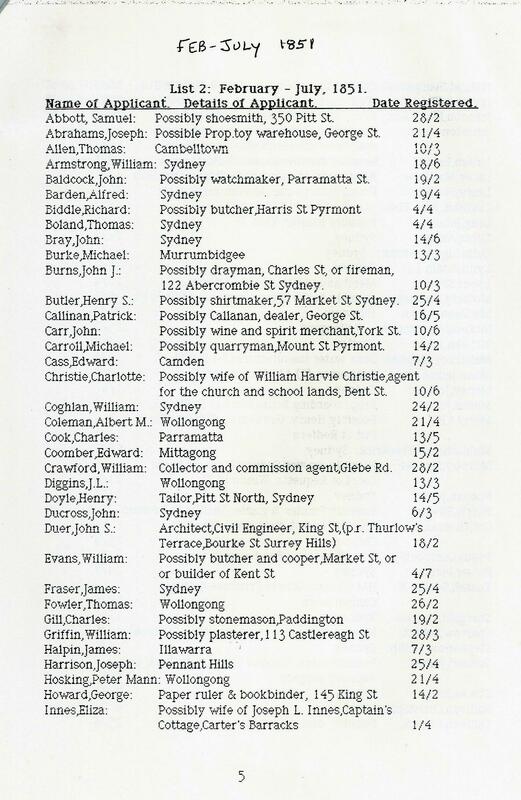 Edward and Elizabeth married 21 July 1851 in St Philips Church, Sydney, by William Cowper, and had 14 children. Elizabeth died 1880 in Bundella, NSW, and Edward survived until 1900, and died in Armidale.